Best-known for their short statures, goofy grins, and bat-like ears, French bulldogs are a massively popular breed in the United States. In fact, French bulldogs have climbed from the 76th most popular breed in the country to the fourth most popular breed in only 20 years! They make a great apartment dog because they're smaller in size and relatively quiet. French bulldogs are actually most popular in urban areas—they're the number one dog breed in New York City, for example. 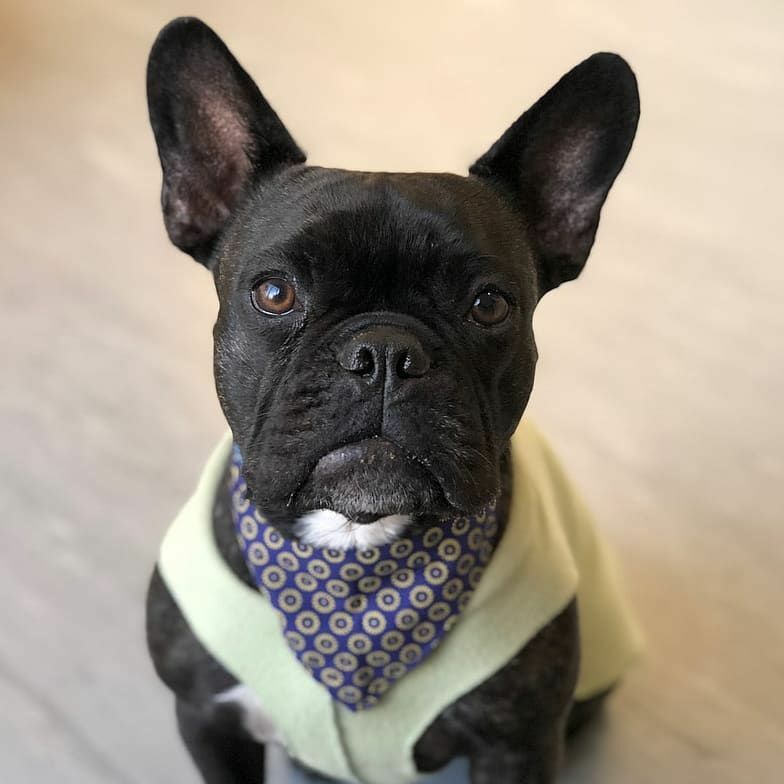 They've been featured in many movies, TV shows, and ads over the last few years, and lots of celebrities, like Lady Gaga and Leonardo DiCaprio, have pet Frenchies. But there's a lot more to French bulldogs than their popularity! Whether you already own a French bulldog or are considering adding one to your family, read on for some interesting facts (along with cute pictures!) about one of the country's most popular breeds. No, despite their name, French bulldogs do not hail from France. Rather, they originated in nearby England—and have a pretty interesting history. Long before climate control, English artisans (particularly lace makers) would use toy-sized bulldogs as lap warmers to keep cozy while they worked in their shops. Then, when the Industrial Revolution hit England and their skills were no longer needed, many of these artisans moved to France, where their skills were still relevant, with their dogs in tow. There, the pups most likely bred with terriers to create the Frenchies we know today. Without a doubt, a French bulldog's bat-like ears are one of his most distinctive characteristics. But did you know Frenchies' ears can be folded over (referred to as "rose ears"), too? These rose ears are a trait Frenchies share with English bulldogs—a throwback to their doggy ancestors in English artisanal shops. Early on, American breeders decided that Frenchies' ears should be bat-like, rather than folded, because it gives them a very distinctive look. Believe it or not, American breeders actually formed the French Bull Dog Club of America in protest of Frenchies with rose-shaped ears! Due to their short stature, many male Frenchies can't reach female Frenchies to, ahem, copulate—they often end up overheated and tired just trying. Accordingly, many French bulldogs are the result of artificial insemination. This extra step certainly increases the cost of each pup in the litter, but it can ensure the parents (and puppies) won't have any health issues during the gestation or birth periods. What's more, female Frenchies typically undergo a cesarean section when they're ready to give birth. Oftentimes, their small, compact bodies can't handle the stress of a natural birth. Despite the doggy paddle's name, not all dogs can (or should) swim—especially French bulldogs. Due to respiratory issues caused by their short snouts, as well as their short statures and skinny legs, Frenchies are at a much higher risk of drowning than other breeds. If you have a French bulldog, use extreme caution when near a body of water. It's a good idea to invest in a doggy-sized life vest. In addition to swimming, French bulldogs should avoid flying, too—they're the breed most likely to die in airplane cargo holds. Their very short snouts are susceptible to several respiratory issues, which can be exacerbated by changes in the dog's stress levels or body temperature. Use a pet carrier if your Frenchie can fit, and take her on the plane with you. Make sure your Frenchie is a healthy weight and doesn't have any health issues prior to your trip. Try to familiarize your dog with her travel crate, so she won't feel so stressed out when traveling. Travel very early in the morning or very late at night when the airplane cargo hold is cooler. Like we said, French bulldogs are extremely popular among city and apartment dwellers. Their small size, relatively chill demeanor, and infrequent barking make them the perfect pooch for smaller spaces with thin walls. Just how popular are they in America's metropolises? French bulldogs are the number one breed in New York City, Los Angeles, San Francisco, and Miami; number two in Chicago; and number three in Atlanta and Washington, DC. Although they don't bark too often, French bulldogs are very vocal—and love to talk to their owners. They use a range of snorts, gurgles, and yips to create a language that's all their own. We all know Toto from the movie The Wizard of Oz—he's an iconic doggy actor! But did you know the series of childrens books the movie was based on actually starred a French bulldog? It's said that the book's illustrator owned a Frenchie named Quinn, and he included his pup throughout the original series. Another fun Frenchie rumor? A French bulldog was originally cast as Toto for the film, but he wouldn't follow direction—so he was replaced with Terry, the Cairn Terrier who played Toto.